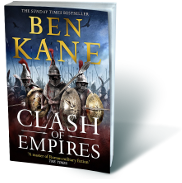 After sixteen years of bloody war, Hannibal Barca is on the verge of defeat. On the plains of Zama, Felix and his brother Antonius stand in the formidable Roman legions, ready to deliver the decisive blow. Victory will establish Rome as the pre-eminent power in the ancient world. Meanwhile, young senator Flamininus is set on becoming one of the Republic’s greatest military commanders with his eyes on the as-yet-unconquered Macedon and Greece.